Sun, Mon, Wed, Thu 5pm - 1am, Tue, Fri, Sat 5pm - 1am. The days of the typical nightclubs filled with booming music and strobing lights may be slowly coming to a standstill in Las Vegas. Recent nightclub openings have shown a different side of Sin City – a more sophisticated side that relies less on the seizure-inducing qualities of the Las Vegas nightlife. 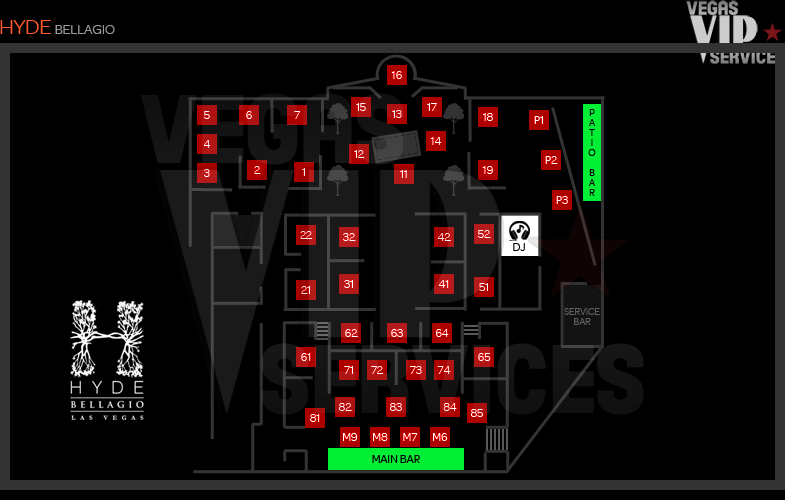 Amongst these new clubs offering access to this new side of Sin City is Hyde. Acting as the Bellagio's newest foray into Vegas nightlife and the hotel's first attempt at catering to the up and coming "Dayclub" craze, Hyde Las Vegas brings an overt dose of sophistication and class with an Italian-themed decor and atmosphere. The Bellagio's newly opened Hyde Lounge is everything but the typical Las Vegas club. At 5 p.m., Hyde opens its doors to an illustrious "Living Room" to the evening crowd. This dayclub allows guests to kick off the evening with a few light cocktails and small bites from the nearby Sirio Maccioni restaurant, Circo. The beverages at Hyde are all but typical as the expert "mixologists" add a hint of science fiction with an array of smoking drinks (an effect obtained through use of dry ice). 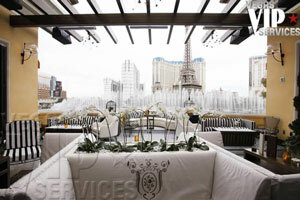 Guests of the Living Room are treated to a breathtaking view of the famous Fountains of Bellagio. Front row seats to the outdoor spectacle is sure to sooth even the most high strung. At 10 p.m., Hyde Lounge Las Vegas near doubles in size as the Grand Salon and gorgeous Tuscan Gardens open to the nightclub crowd. Dressed in white and furnished with pieces seemingly pulled from a Tuscan villa, the Tuscan Gardens create the ideal setting for pleasant conversation and relaxation. The Tuscan Gardens amplify the view of the Fountains of Bellagio, if only due to the glowing waters brought on by the setting sun. Two large bars give Hyde its true "club" atmosphere and with a vast selection of skillfully mixed beverages, they're sure to attract the crowd. Despite Hyde's sophisticated decor, it is still a nightclub. Catering to the nightlife crowd is Hyde's DJ booth, which takes on the look of a working fireplace made of petrified wood. Hyde Lounge's world class DJ's rotate to ensure the experience never goes stale. 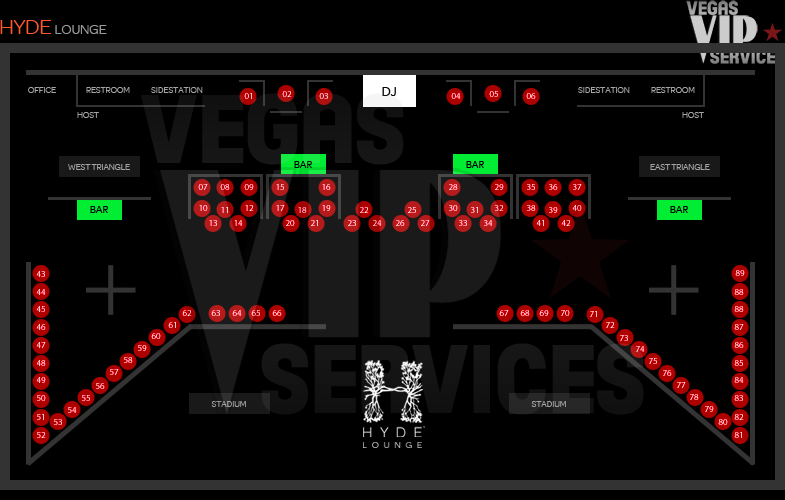 40 VIP booths are available throughout the club, offering up first rate and unmatched views of the gorgeous Fountains of Bellagio. Hyde's success comes not from the "nightclub" aspects it offers, but from the perfected decor that creates the Italian villa feel. This isn't a typical nightclub, so the loud, pounding music is swapped out for softer tunes that actually allow for pleasantries like conversation. Small touches like marble tile and chandeliers work together to create atmosphere that can soon to be expected to be a highly sought after experience in Sin City. Where the city once thrived on the usual loud music and crowded dance floors, sophistication is slowly making a stand – and Hyde Bellagio is the perfect example of what's to come. 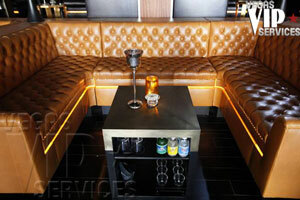 Contact Vegas VIP Services to reserve your Bottle Service at Hyde Las Vegas. Las Vegas needed such upscale lounge located at the heart of the strip, I was happy to see Chateau but Hyde is a lot more exclusive.